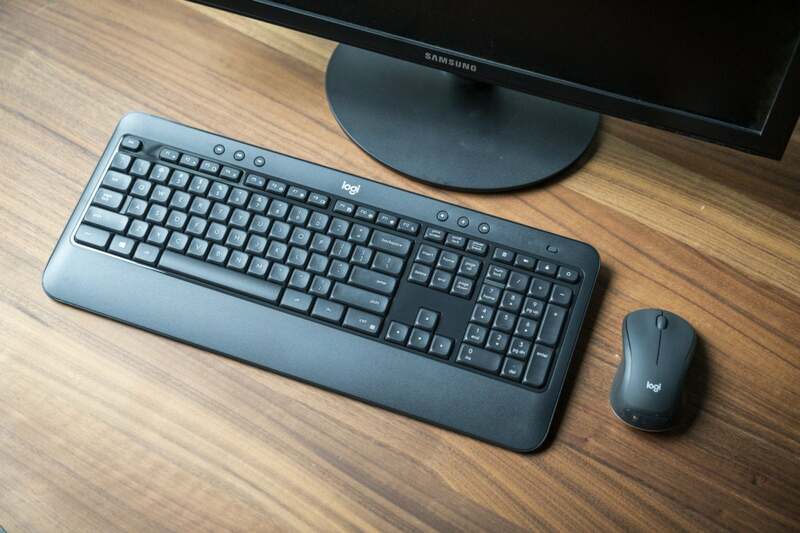 Dedicated typists looking for a premium, snappy keyboard without going the mechanical way should give the wireless MK540 Advanced combo a serious look. Logitech’s enticing $60 bundle serves up a roomy keyboard complete with dedicated media buttons, programmable keys, and tactile typing with a minimum of clickity-clack, while the solid mouse offers smooth scrolling plus programmable gestures. 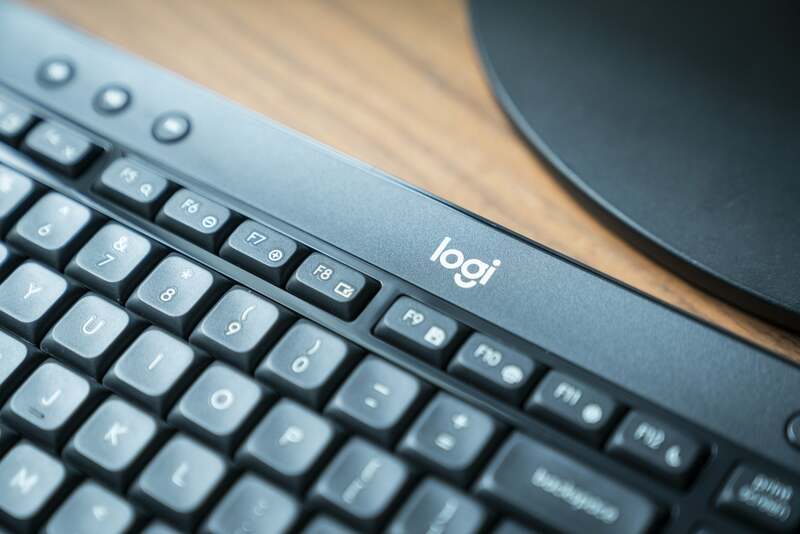 Our only quibble is with the Logitech MK540’s limited Mac support. This keyboard is truly a good deal and has earned our Editor's Choice. You can see other competing models in our full roundup of wireless keyboard reviews and rankings. We've also gathered our gaming keyboard reviews in one place, if that's what you're looking for. Measuring 18 by 7.6 by 0.9 inches and weighing 1.9 pounds with the batteries installed, the roomy MK540 isn’t a keyboard you’ll want to stuff in your backpack for mobile typing. That said, the $60 keyboard feels great sitting on a desktop, particularly thanks to its curved plastic palm rest. The MK540 also comes with retractable rear feet that tilt the keyboard at a four or eight-degree angle. The media playback and volume keys on the MK540’s keyboard sit by themselves above the main keys. The Logitech MK540 comes with plenty of hotkeys, ranging from search, save, and print to setting, lock, and calculator. You also get 10 programmable keys, which you can customize using the Logitech Options app. A nice bonus are the dedicated volume and media playback keys, which flank the Logitech logo just above the main keyboard. A single, compact USB dongle connects the Logitech MK540 keyboard and its bundled mouse via wireless 2.4GHz RF signals. Both the keyboard and mouse sprang to life the moment I connected the USB dongle to my PC, no drivers necessary. The keyboard goes to sleep after about a few minutes of inactivity, but reconnects immediately after a tap of a key. 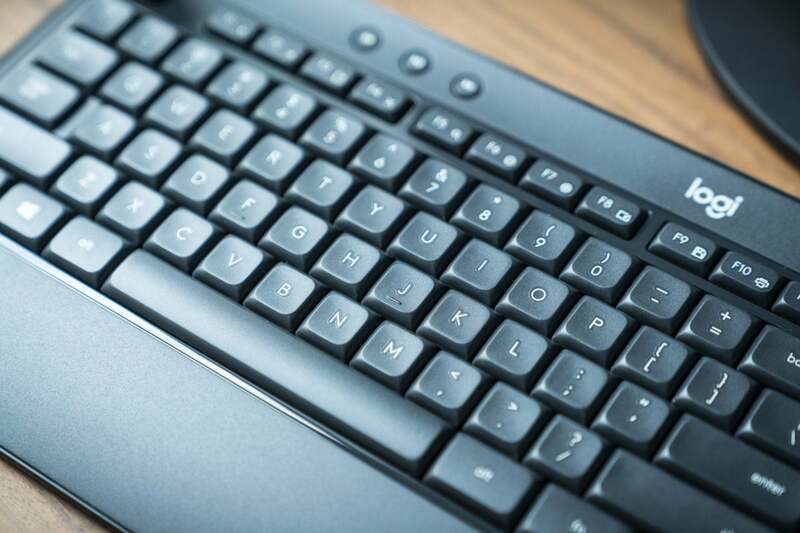 Designed for Windows and Chrome OS systems, the MK540 keyboard and mouse can, in fact, also connect to a Mac, although there’s no way to correctly map the keyboard’s hotkeys to MacOS functions. 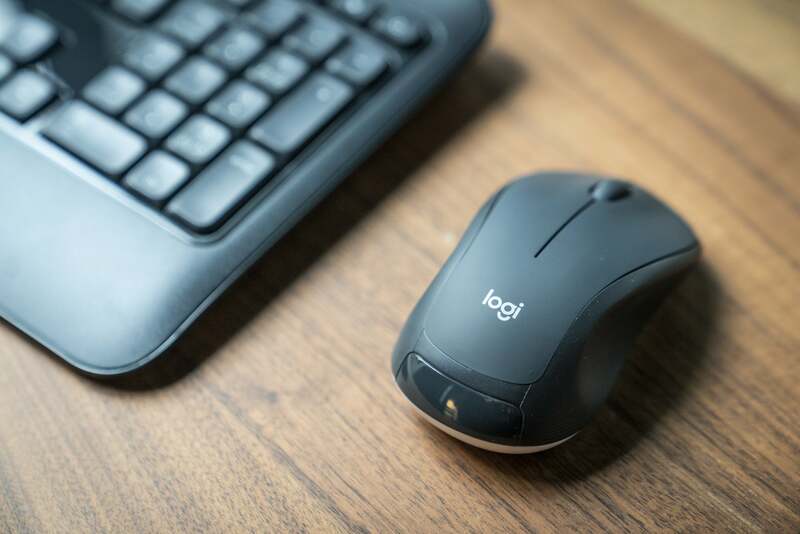 The broad spill-resistant keys on the Logitech MK540 sport a slightly contoured and sculpted design, making for easy discovery and a quality feel. Built using membrane-style switches, the MK540’s keys deliver a pleasing, solid bump about halfway through each keystroke, plus a nice snappy action as the keys spring back into place. As a typist who prefers clicky keys rather than bumpy ones, I was surprised how good the MK540’s keys felt to my fingertips. The MK540’s slightly concave and sculpted keys make for easy discovery. Because it goes for more of a bumpy approach than a clicky one, the MK540 keyboard manages to stay impressively quiet, a quality that’s sure to please nearby workmates. Indeed, the MK540 strikes a happy balance between a tactile typing feel and easy-on-the-ears keystrokes. The three-ounce ambidextrous mouse that comes bundled with the Logitech MK540 keyboard boasts a rubberized feel on the sides, a subtly bumpy scroll wheel, and a smooth glide that made for satisfying mouse scrolling. The mouse buttons felt a tad cheap compared to the rest of the mouse, but clicking them felt snappy nonetheless. The mouse that comes bundled in the MK540 Advanced package boasts smooth scrolling and programmable gestures. As with the keyboard, the MK540’s mouse is programmable via the Logitech Options app. For example, you can set the scroll wheel button to do any of a dozen tasks, from switching apps and launching the Windows calculator to closing a window or even shutting down your PC. You can also use the middle button as a gesture control, which lets you maximize windows, switch virtual desktops, rotate items, and more, all by simply pressing the scroll wheel and scrolling up, down, left or right. Quiet yet snappy, roomy and programmable, the reasonably priced Logitech MK540 Advanced keyboard will appeal to typists looking for tactile typing experience without making too much of a racket, while the bundled mouse impresses with its smooth, solid scrolling and programmable gestures.